Nothing new to see here. 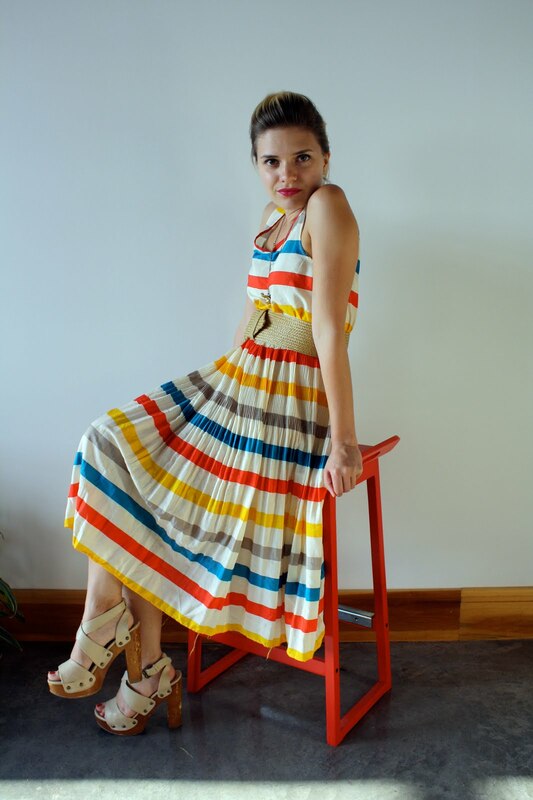 I've shared it with you all before, but I'm still loving this playful striped dress. Despite its decidedly summery sensibility, I'm starting to think about how to transition the frock into fall. A cropped sweater and ankle boots just might do the trick. Don't forget to enter the jcpenney giveaway! LOVE that dress!! It'd be fab with tall boots, short boots, chunky sweater, skinny cardigan, belted...goodness, what a fantastic piece! Everyone and their MOTHER is wearing that dress on the blogs. LOVE it!! I love this dress! Love the length. It would be perfect for fall with a chunky sweater. Love love love that dress! Can't wait to see how you take it into fall. Yeah, I'm not a creeper, but I totally just bought it too. I saw it linked on @calivintage and had to have it. THANK YOU for inspiring my one summer dress purchase. Oh my! Love this dress ...! Everytime I see it I want it a little more. Great dress, great styling, and great set-up for the photo! Makes me want to branch out to multi-colored stripes! Gah! This whole outfit is KILLING me! So cute! It's like you're channeling one of those huge amazing lollipops. I'm have a serious envy moment here. This dress is really wonderful, the colours are so fabulous. I think it would look great with a chunky cardigan and belt. I love the cheerful dress!! That dress is so incredibly fun and colorful! I think I'd be spinning in it constantly if I owned it. Very cute look.